I am of the belief that if the pages of your cookbooks are too clean and pristine then they haven't been used enough. This morning I opened up my immaculate Ripe: A fresh batch by Angela Redfern. A couple of hours and an oven's worth of cake later I closed the pages that were now translucent from oil and coarse from smeared batter. A job well done I think. I seem to have gained a reputation at my work for baking. I guess that tends to happen when your unofficial job description grows to include Tuesday scone making sessions. I also happened to bring in two birthday cakes for myself. One for the day and one of the left overs from our tea party in the park. I even brought brownie along for morning tea on my warehouse induction day. Making people birthday cakes is a good excuse to try out some of the bookmarked recipes that I have had my eye on. This is also the first post I get to write that will be published on my new site which I am so excited about. It is still a work in progress but I hope you all like the changes so far. Id been thinking about getting my own domain name for a while, Alex had been pestering me about it for months. Then one day he sent me a link to this cool provider Square Space. It was so frustrating, I was at work, with only my iPhone to investigate it with. I was frantically emailing him questions about it. Yes this is the Alex the previous S'more cupcake post was written about (told you we could still be BFFs). As soon as I got home that evening I cracked open a beer, threw open my laptop and signed up at once. Six hours and a years subscription later I went to bed having not done much else except stare intently at my screen. This weekend has basically been punctuated with fiddling with the blog and its layout. I am really excited to see where it is headed. This cake is for a lovely lady in accounts who also has a passion for baking. She, like myself always makes the cakes but when it comes to her own birthday also has to make her own. But not this time! In secret squirrel fashion at the request of payroll we plotted to bring her a cake in on Monday as a surprise. Quite a bit of pressure considering I had never made this particular cake before. We are currently in peak feijoa season so a lot of you probably have the things falling off your tree faster than you can scoop them. If you have no use for them immediately, scoop the pulp out and freeze it just like you would old bananas for when you next need to make a cake. The riper the feijoa the better. This cake uses a horrendous amount of oil. I bought a 500ml bottle and started measuring out the two cups worth with a measuring cup before I clicked that I may as well pour straight from the bottle. Ah well, what they don't know won't hurt them. I used two 26cm cake things for this. There is a lot of batter produced by this recipe so you could also get away with making three 20cm cake layers. Just reduce the cooking time to half an hour then test every five to ten minutes from there before they are done. Preheat the oven to 180 degrees on bake and grease and line two 26cm cake tins. In a mixer or a large mixing bowl, beat together the eggs, sugar, oil, ground ginger and cinnamon. Once combined, mix in the feijoa pulp. With the beaters still going, slowly shake in the dry ingredients into the wet mixture. Mix until just combined. Stir through the drained crush pineapple and walnuts. Divide the batter evenly between the two tins and bake for around 40 minutes. I had to put my cakes on different layers which wasn't ideal. The bottom cake got a bit overcooked so try and avoid doing this. Place tin foil over the tops of each cake after about half an hour to prevent the tops form voer browning. At 40 minutes test the cakes with a skewer. If they come out covered in batter return the cakes to the oven for 5 minute intervals until they do come out clean. Remove the cakes from the oven and leave to cool for fiftenn minutes before turning out onto a wire rack to cool completely. To make the filling, bring the ingredients to the boil and simmer for around five minutes before the excess liquid becomes syrup. Leave to cool. To make the icing, beat together the cream cheese and butter until nice and smooth. Slowly add the icing sugar and beat until it all comes together and becomes fluffy. You will probably need a splash of milk to help loosen it up. Beat in the ginger and the lemon juice. To assemble, place one of the cakes on a cake stand or plate, smear just under half the icing onto the base layer and smooth over the top. Carefully place the feijoa filling on top of this. Place the top cake layer over the top. 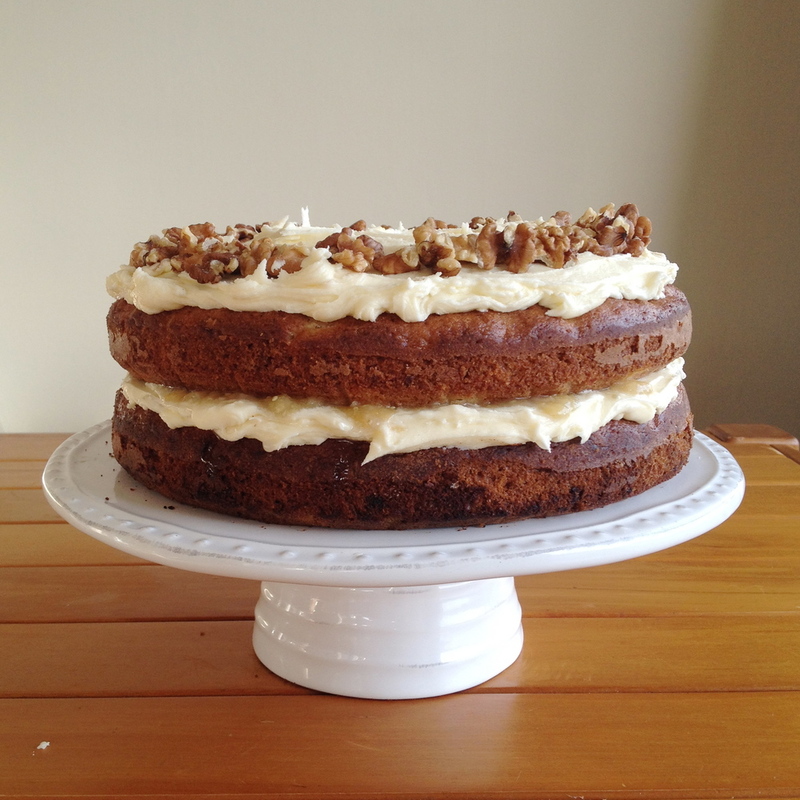 Smooth icing over the top of this cake and garnish with fresh feijoa flesh and chopped walnuts.